Last December, shortly before this end-of-year column went to press, we had to make a significant last-minute edit. A few hours earlier, Gov. Peter Shumlin dropped the biggest news of the year: He was abandoning his long-promised plan to build a single-payer-style health care system in Vermont. That decision, in many ways, drove the politics of 2015. Having alienated Democrats, Progressives and Republicans, Shumlin limped through his fifth legislative session and, shortly after it concluded, announced he would not seek a fourth term. His impending retirement launched a cascading series of open political contests — for governor, lieutenant governor, House speaker and the legislature. That would've been enough to keep any political columnist busy. But 2015 was also the year in which a state senator was arrested for sexual assault on the grounds of the Statehouse. And the governor appointed independent counsel to investigate alleged wrongdoing by the attorney general. Even those weren't the biggest stories of the year. This was: After laboring in relative obscurity for nearly 45 years, Vermont's own Bernie Sanders became a national phenomenon — and the populist alternative to Hillary Clinton in the Democratic presidential primary. It was the year of Bernie Mania. Win or lose, Sanders has established himself as a progressive icon and leader of the left. Like former governor Howard Dean, he has put Burlington on the political map and brought a uniquely Vermont sensibility to the presidential election. In the end, legislators split roughly along party lines, with 110 supporting Shumlin and 69 backing Milne. The reelected incumbent didn't get a chance to celebrate. Later that afternoon, some 250 activists stormed Shumlin's third inauguration, demanding hearings on his abandoned single-payer plan. They sang songs, unfurled banners and staged a sit-in on the House floor. By the time the last protester was dragged out of the Statehouse and arrested, Shumlin's big day felt like a bust. Legislators had failed to address rising property taxes during the 2014 session — and paid the price at the polls that November. So they returned to Montpelier in January 2015 with a pledge to tackle the perennial problem. Leading the charge was House Speaker Shap Smith (D-Morristown), who assembled a special committee to explore the growth of education spending as enrollment continued to drop. After months of debate, legislators adopted a school governance reform bill that would provide the state's 277 overlapping districts carrots and sticks to merge into larger ones by 2019. Some critics shrugged it off as a nothing-burger, while others characterized it as the end of local control. By fall, Act 46 had become a potent political issue. School board members were particularly concerned that their budgets would blow through the new law's variable cap on per-pupil spending. In response, Shumlin pledged to return to the Statehouse in January 2016 to delay the cap for a year — or dump it altogether. In 2012, a little-known developer and airport commissioner named Miro Weinberger came out of nowhere to narrowly win the Democratic nomination for mayor of the Queen City. Three years later, he coasted to reelection on Town Meeting Day with 68 percent of the vote — clobbering Progressive Steve Goodkind (22 percent), independent Greg Guma (7 percent) and Libertarian Loyal Ploof (2 percent). When the state's top office opened up in June, Weinberger declined to make a move. But rest assured: You'll see this 45-year-old pol on a statewide ballot sometime soon. Attorney General Bill Sorrell summoned reporters to his Montpelier office in March to accuse 2014 lieutenant gubernatorial candidate Dean Corren of violating public election financing law. He said Corren had improperly asked the Vermont Democratic Party to email its supporters on his behalf. Sorrell's proposed penalty for the $255 email? $72,000. Over the next six weeks, Seven Days published a series of stories demonstrating that Sorrell himself had played fast and loose with campaign finance law. A Republican operative, Brady Toensing, seized on the stories and filed a series of complaints with the AG's office. Shockingly, Sorrell declined to investigate himself. After a Senate committee called the AG in for questioning in April, Gov. Shumlin and a panel of state's attorneys appointed former lawmaker Tom Little to investigate the charges. As of press time, Little had yet to release the long-awaited report. Sorrell's opponent in the 2012 Democratic primary, Chittenden County State's Attorney T.J. Donovan, announced in June that he was running again. Three months later, Sorrell bowed out of the race. The 2015 legislative session was even more taxing than usual. It opened in January with a $90.4 million payroll tax proposal from Gov. Shumlin. And it closed in May with a budget and tax standoff that nearly resulted in a gubernatorial veto. His payroll tax, designed to address the Medicaid cost-shift, never really got an airing. Legislators appeared more interested in debating a sugar-sweetened beverage tax — but that, too, died an inglorious death at the hands of House leaders. Most of the session was spent figuring out how to close a $113 million budget gap. Appropriators managed to find $53 million in cuts, but that wasn't enough for Shumlin, who spent weeks disparaging the $30 million worth of tax hikes proposed by legislative leaders. In the end, Shumlin caved and agreed to spare his fellow Democrats a veto session. On a warm Thursday night the week before the legislature adjourned, plainclothes Vermont State Police troopers arrested Sen. Norm McAllister (R-Franklin) in a parking lot outside the Statehouse. Authorities accused him of sexually assaulting two women and attempting to coerce a third. The Highgate farmer pleaded not guilty and was released on bail. After learning that one of the alleged victims was McAllister's young Statehouse assistant, leaders of every party called for his resignation and a Senate panel stripped him of his committee assignments. As summer turned into fall and fall into winter, Senate leaders realized McAllister was serious about returning to the Statehouse in 2016. Sensing they didn't have the votes to expel him before he stood trial, they rallied behind a motion to suspend the senator. It passed the Senate Rules Committee in December and was scheduled for a vote on the Senate floor in January. Three weeks after the legislature adjourned, Gov. Shumlin summoned staff and cabinet members to a Statehouse meeting room, where he delivered the news that he wouldn't seek a fourth two-year term. "I want these 18 months in office to be focused entirely on continuing the work that we have started together," he told reporters later that morning. The announcement shocked political insiders, despite Shumlin's dismal legislative session and near-loss the previous November. It marked the beginning of the end of an era for a wily Putney pol who had climbed the ladder from the town selectboard to the Senate presidency to the chairmanship of the Democratic Governors Association. When his term expires next winter, Shumlin plans to return to southern Vermont with his new wife, Katie Hunt, and get back to work at the family business, Putney Student Travel. But it's hard to imagine we'll have seen the last of him. Shumlin's retirement announcement launched an especially early and competitive gubernatorial race. Within days, nearly every politician with a pulse said he or she was considering a run to replace him in 2016. The rare opening at the top of Vermont's political hierarchy set other races into motion. Currently vying for Scott's job as LG are Rep. Kesha Ram (D-Burlington), Sen. David Zuckerman (P/D-Chittenden), Marlboro Democrat Brandon Riker and 2012 Republican gubernatorial nominee Randy Brock. Ram and Zuckerman will abandon their legislative seats to run. And Smith's retirement from the legislature will prompt a race for House Speaker. The quadruple homicide that rocked central Vermont in August was not a political story, per se. It was a tragedy. But the murders of three Berlin women and a Department for Children and Families social worker certainly had political repercussions, tied as they were to such potent issues as child protection, substance abuse, mental illness and guns. Most immediately, state workers wondered whether they were being adequately protected from harm. One of the victims, DCF caseworker Lara Sobel, was killed as she was leaving work. Others wondered whether chronic understaffing at DCF contributed to the tragedy. Sobel had worked with the alleged shooter, who was apparently upset that her child had been removed from her custody. Five months later, Gov. Shumlin called for 35 new positions at DCF, arguing that the state's opiate crisis was straining the child welfare system. The tragedy may also add fuel to Vermont's long-running debate over its lax gun laws. When gubernatorial candidate Minter announced support for universal background checks in November, she cited the August shootings, saying: "Vermont is not immune to gun violence." Thirty-four years after Burlington elected him mayor, Sen. Sanders announced in April at a Capitol Hill press conference that he would seek the Democratic presidential nomination. At first, Sanders was treated as a curiosity, not a contender. But the 74-year-old democratic socialist quickly caught fire. 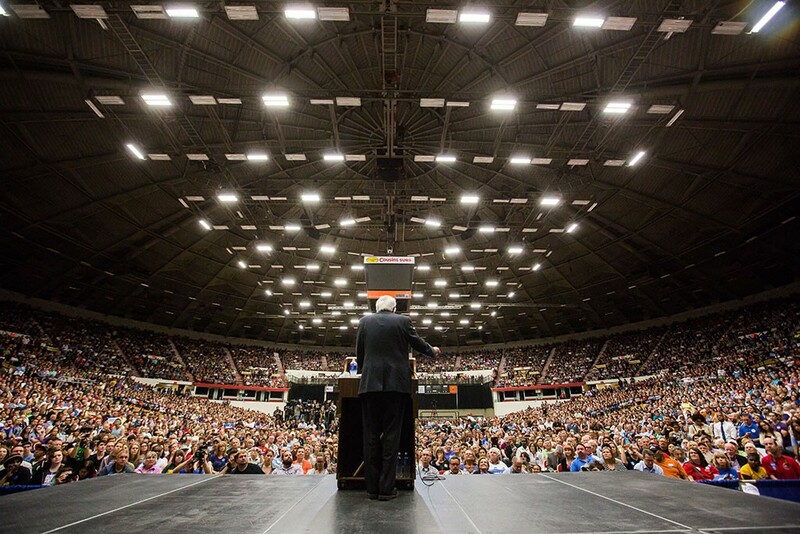 Within weeks of his May campaign kickoff on the Burlington waterfront, Sanders was packing arenas coast to coast. The words "feel the Bern" became a thing. By September, the hitherto little-known Vermonter was tied with Clinton in Iowa and leading her in New Hampshire. By October, he was raising nearly as much money as the formidable fundraiser — largely from small-dollar donors. But Sanders' mo' took a hit later that month when Vice President Joe Biden finally declared he would not join the race. With Biden out, Clinton further consolidated establishment support — and Sanders' rise seemed to stall. His economic message, meanwhile, found less resonance after terrorist attacks in Paris and California refocused the election on national security and foreign policy. Sanders still has a month to go before the Iowa caucuses. As Vermonters have learned by now, it's never wise to count him out. Corrected, January 10, 2016: An earlier version of this story listed the wrong year when describing the 2015 legislative session. It also inaccurately characterized which legislative body was scheduled to vote on Sen. Norm McAllister's suspension: It was the Vermont Senate. The original print version of this article was headlined "The Politics of 2015"